Visual art is an integral part of the arts, in turn the arts are an integral part of culture. This is primarily due to the innate value of life enhancement, entertainment and definition of personal and national identities embedded in culture. This value can be traced through the various social and educational benefits of culture; ending with the economic ones, otherwise we risk the cynicism of Oscar Wilde — knowing the price of everything and the value of nothing. Cultural practice should be considered a valuable part to sustainable existence and warrant investment. The 2008 United Nations Conference on Trade and Development (UNCTAD) prepared a comprehensive report describing what the authors called a `new paradigm’ in which culture and creativity are “powerful engines driving economic growth and promoting development in a globalising world.” They compiled extensive data on international trade in cultural goods ranging from carpets to paintings, and held discussions about the mechanisms for channeling public resources and investment into the cultural economy. For a country like Uganda looking for ways of creating a sustainable tourism product, developing a synergy between culture, arts and other sectors of the economy is crucial. In the US during the 1930s and early 1940s, the Works Progress Administration included public support for artists and writers alongside the building of roads, bridges and public buildings as activities worthy of funding. All of these activities were viewed as having a stimulating effect on the economy. The artworks created through this program are highly prized today. The establishment of the Dak’Art biennale in Senegal in 1989 saw a tremendous increase in numbers of art scholars and tourists visiting this African nation. By incorporating a viable cultural and artistic component, Senegal was able to provide an alternative avenue for tourism marketing to a different brand of tourist more concerned with the cultural and artistic features as opposed to the foundational Transatlantic Slave Trade. It is therefore imperative for Uganda to identify complimentary linkages between the arts and other sectors of our economy such as tourism and exploit them if holistic economic growth is to be realised.There are a number of strategies that Uganda could adopt to ensure a multidimensional tourism industry that would create employment and wealth opportunities for its citizens. The establishment of arts councils or associations in small communities would help entrench cultural tourism throughout the country. This would ensure that development is not concentrated in the large city areas but would serve as impetus for rural development and community revitalisation. This would create vibrant spaces in small neighbourhoods, expand business opportunities and improve the quality of life. To bring this vision to fruition within the context of small, rural communities, the strategy of “place promotion” could be employed. This is where focus could be placed on historic settings or the community becoming popular for a particular set of historic events or special buildings. The community could be developed to include museums, art galleries and a major annual festival that reflects such events and celebrates its historic significance. Furthermore, in our thrust to create a cadre of cultural practitioners and change the direction in the development of our country’s tourism industry, arts should be made an even greater priority within our education system which has focused more on producing doctors as opposed to actors, and accountants instead of painters. It is my view that much as we need these doctors and engineers, emphasis on the sciences in our education system is not going to give us a comparative advantage in the global marketplace for the simple fact that other economies are literary light years ahead in this venture. On the other hand, Ugandan visual artists, if supported and nurtured — with an emphasis on cooperation rather than competition in the identification and promotion of local talent to global prominence — have the potential of earning tax incomes on the sale of their artworks on the international art market. One case is from Ghanaian artist El Anatsui, who sells sculptural installations in the West at prices over 800,000 US dollars a piece (Bonhams Auction 2012). Now this is the equivalent of about 1300 gorilla permits (currently $600 each). I am reliably informed that Uganda sells on average 1000 permits a year. Do the math. The point here is that incorporating arts and culture into the tourism product helps to create a distinct image and identity, which is important in creating a comparative advantage. Another strategy would involve exploiting existing linkages between the arts and the tourism industry. For instance many well established hotels throughout the country have interesting historical associations with artists and craftspeople of varying descriptions. Yet, not all of them capitalise on these associations in terms of creating a point of interest or interpreting a sense of locality for their guests. Our tourism industry must adapt a consolidated effort for disseminating information about all the exciting packages for the visitor. This could be through publications in the hotels pointing out artists’ studios and galleries as well as displaying their works within the hotel premises at a fee payable by the hotel management to the artist. Tour companies could also be mobilised to give visitors the opportunity to peruse the art galleries, purchase work and on some occasions work with the artists in their studios in what is commonly called studio tours. Finally government should support and promote private enterprise in the arts and cultural sector through endorsement and direct funding of sustainable art projects such as the Kampala Art Biennale, efforts for a national contemporary art museum and establishment of more regional arts and cultural centres. This is simply because government is the biggest and richest player within the economy and also due to the fragile nature of the creative industry. Again here I would like to point out that the Dak’Art biennale’s success was mainly attributed to the committed involvement of the government of Senegal. My simple explanation as to why the arts industry in the developing world is retarded while that in the developed economies is miles ahead is simply the level of government involvement in subsidising the sector, at least in its initial stage. The Australian government through its ministry for the arts provides funds and grants to arts and cultural organisations as well as individual artists from across Australia to advance its cultural and indigenous sectors. In conclusion, much of the interest in the role played by arts and culture in the boosting of an economy during the past decade has been encouraged and actively promoted by research from a number of writers notably, Richard Florida. Florida’s writing insists on drawing attention to specific occupational categories and types of workers that are part of what he characterises as the creative class. His writing includes poets, novelists, artists, entertainers, and actors as being among the super creative core of workers that drive economic growth. His work could be interpreted as supporting the notion that communities that are culturally active, diverse and provide a good environment for the arts will be economically successful. By creating a synergy within the arts, culture and tourism industries, Uganda can tap into new markets for its tourism product and general economic expansion. 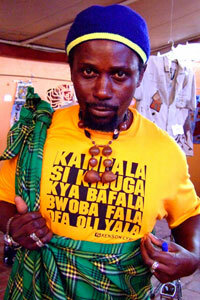 Henry Mzili Mujunga is a Curator and Artistic Advisor, Kampala Biennale 2014. He is also co-founder of Start Journal. This is a very good piece Henry. It has relevant examples that make it easily appreciated to both artists and non artists. My opinion on government funding of the arts is that sometimes its deliberate. African regimes do not want to fund arts and culture because they are very vocal in criticizing their despotic and corrupt nature. Also, government will fund something it sees it can benefit from. The Dakar Art Biennale success story hinges on the huge revenue the festival brings in. Thousands of art aficionados flock this west African country during the month long festival. Uganda i believe is slowly moving towards that path with two international festivals showcased this year. The only challenge now is to sustain them.